The eye-witness account by the apostle John (and also of a disciple named Philip) relates the true narrative of Jesus meeting a Samaritan woman at Jacob’s well. 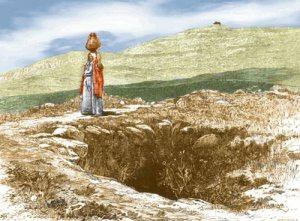 The well and the field surrounding it were gifts from Jacob to Joseph. (And you will remember Joseph. He is the one who received good gifts from his father ~a coat ~ and bad treatment from his brothers.) I have no doubt that the well was, pun intended, well-known to many who traveled though the area. This oasis would be on the minds of those seeking to quench their thirst, thirst brought about by the day’s relentless heat. John’s Gospel account tells us that as Jesus was traveling from one place to another he became tired and thirsty. He stopped outside the town of Sychar in the region of Samaria to rest at the well. As Jesus sat down on the edge of the well he told his disciples to go and get some food in the nearby town. Being midday the sun was directly overhead and the heat was stifling. The group was thirsty and hungry from their long walk. Jesus had no means of retrieving the water from the well. Imagine someone being even thirstier when they know that water is just out of reach. As Jesus sits resting a woman from the town of Sychar approaches the well carrying her clay jar (I am assuming some things here.). The woman comes to the well in the middle of the day because, I suspect, no one else will be there during the hottest part of the day. She has her reasons for not wanting to be around the other women of the town: she sleeps around. “I haven’t got a husband,” replied the woman. “I’m the one ~ the one speaking to you right now, “said Jesus. Just then Jesus’ disciples came up. They were astonished that he was talking with a woman; but nobody said, “What did you want?” or “Why were you talking with her?” So the woman left her water-jar, went into town, and spoke to the people. So they left the town and were coming out to him. “I’ve got food to eat that you know nothing about, he said. “Nobody’s brought him anything to eat, have they?” said the disciples to one another. Several Samaritans from that town believed in Jesus because of what the woman sad in evidence about him: “He told me everything I did.” So when the Samaritans came to him, they asked to stay with them. And he stayed there two days. Many more believed because of what he said. This passage from John’s account thrills me every time I read it. The passage overflows with Kingdom of God thirst quenchers. Is it me or is there a bit of snark in the woman’s reply to Jesus request for a drink? The woman, like most of us, wanted to deflect any accounting of her sinful life. She became polemical and quickly changed the subject. She pressed Jesus about a heated religious and geopolitical issue of the day – our mountain or yours, our religion or yours. Here Jesus reminds the woman of the “truth” (the non-denial) she spoke about herself earlier and about the spirit who is to come so that all who believe can worship the One True God in Spirit and in Truth. The rivers of living water are beginning to flow freely. The extremely costly water bill will be paid in full by Jesus. Jesus begins to talk about harvest time as he sees the Samaritans come running out to see what the woman was talking about. The fact that the woman, a harlot, told them that Jesus told her everything she had done, made a impression on the town gossipers and on the wives whose husbands had betrayed them with her. It was no easy thing to tell the people of the town her ‘secrets’ but Jesus was like no other. “Come and see” she told them. Fast forward: the ‘anointed one’ has been crucified. The resurrection has occurred. Jesus meets with his disciples and at least 120 people have seen him. Jesus breathes on the assembled disciples and they receive the Holy Spirit. Jesus ascends to the Father. The Spirit, in the form of wind and fire, descends upon the praying assembly of eye witnesses. Persecutions began in full fury. And, a different unequivocal message had to be sent out to counter the Truth. The message was sent via Stephen. Stephen, a man said to be full of the grace and power had testified to the Facts of Jesus before the Super Pac. He held nothing back. So, he was quickly shut up by being stoned to death. His last words: “Lord, don’t let this sin stand against them.” Saul, the soon-to-be Paul of missionary fame, was the eyewitness of Stephen’s martyrdom. Immediately after Stephen’s death a Christian Diaspora began. Christians, except for most of the apostles, fled Jerusalem. Philip goes to Samaria (see The Acts of the Apostles, Chapter 8). The word and the living water gets around. Remember Samaria? “Rivers of living water” began streaming throughout the world ~ God’s Kingdom on earth. Souls are being replenished with waters from the deep well cut out of the Solid Rock . Do you see why I find this Samaritan woman’s story so brimful of Kingdom Thirst quenchers? As Christians we must “Come into the results!” The message of the Kingdom of God is inclusive: it is for Jews and Greeks, men, and women ~ for anyone who receives him. One last thought: Jesus was poor. As the above story reveals, his poverty, his hunger did not overcome him or preoccupy him. He, instead, before all else, willed to do the will of the One who sent him. That was his food and drink. That was enough.